If you've heard about on-foot hidden transmitter hunting but haven't tried it, or if you are a beginner that needs some practice and guidance, this free introductory session in Mission Viejo is for you. A ham radio license and knowledge of radio equipment are not required. Experts will be on hand to teach you the basic techniques of on-foot radio direction-finding (RDF). Bring the kids and grandkids, then go out on the course with them! This event is sponsored by South Orange Amateur Radio Association (SOARA) and will take place at the Mission Viejo Community Center. Your host is Erik Wresch W6INE. Course-setter is Joe Moell KØOV. The session gets under way at 9 AM with instructions on techniques for on-foot transmitter hunting, followed by an opportunity to find some two-meter band transmitters located in the surrounding park. There is no charge for this event. A limited amount of radio direction finding gear will be available for loan. If you have receivers, scanners, directional antennas, attenuators, or other equipment suitable for on-foot RDF, be sure to bring it. Make sure all batteries are fresh. All ages are welcome, but young children must be accompanied by an adult at all times. For those who want to build RDF gear for use with their own two-meter hand-held radios or scanners, Marvin Johnston KE6HTS will bring kits for measuring-tape yagis and active attenuator circuit boards. 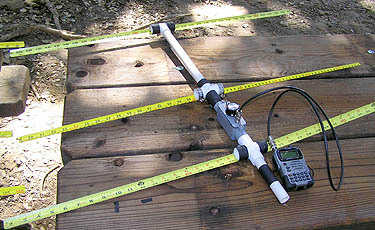 He also has complete antenna/attenuator kit that includes the power switch, BNC connector, housing and battery, ready to install as the tape measure beam is built. (Photo at right) There will be tools and soldering stations for building. If you're not an electronic technician, don't worry because there will be experts to help you. We want you to succeed! Send e-mail to Marvin (marvin@west.net) to pre-register and get more information about equipment. The building session will only take place if there are sufficient advance registrations and will begin at 9 AM. If you already have equipment and just want to hunt transmitters, you don't need to pre-register. The Mission Viejo Community Center is also known as the Norman P. Murray Community & Senior Center. For your GPS navigation system, the address is 24932 Veterans Way. From Interstate 5, take the La Paz Road exit, go east 1.6 miles past Marguerite Parkway to Veteran's Way. Turn left (north) and continue one-quarter mile to the Community Center parking lot. Talk-in is on the SOARA Laguna Beach repeater, 147.645(–) PL110.9. Click for a Google satellite map.